Elaine Wang wears the colour red, a symbol of luck, for her mother who was born in year of the rabbit. Photo by Miranda Gathercole. For one Kwantlen student, welcoming the Year of the Rabbit was emotional in a different way than usual. Elaine Wang, president of the Chinese Student Association, celebrated the most important Chinese festival away from her family for the first time in her life. 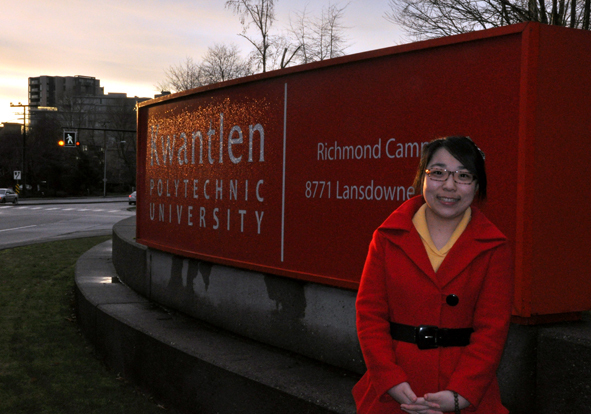 Wang immigrated to Canada less than a year and a half ago to study at Kwantlen, while living with her uncle in Richmond. For Wang, this Chinese New Year spent away from family in China marked an opportunity to work with the KSA and open up Chinese culture to the students of Kwantlen. Wang says that it is also a way to bring a sense of community to other Chinese students who might be missing family back in China. 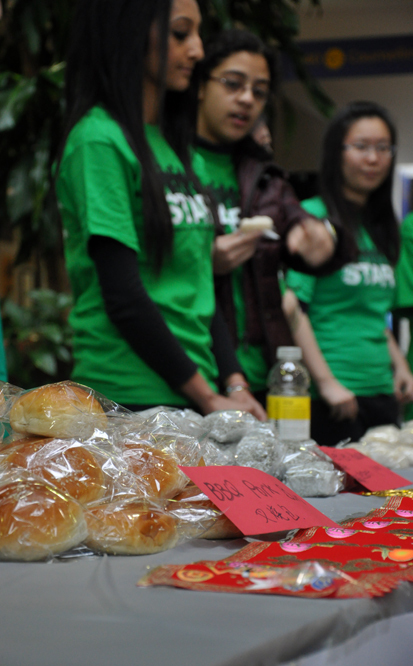 The group set up tables and handed out pork buns and sweet treats, traditional Chinese delicacies which are often eaten in the celebration of the New Year, to students at the Richmond, Surrey and Langley campuses on Feb. 3. “We tried to choose items that would respect the traditional Chinese New Year aspect of it and something that all students could eat and try,” said Reena Bali, director of events and student life for the KSA. Lesha Ghirra, left, and Sarah El Bakkouri volunteer with the KSA to hand out BBQ pork buns, green tea-flavoured desserts and peanut-flavoured desserts to Kwantlen students at the Richmond campus. Photo by Miranda Gathercole. In China, red envelopes, which usually contain money, are given by elders to children and family members to represent good fortune to come in the New Year. “My grandfather said ‘I will keep the red envelope for you. If you go back China, I will give you,’ so it make me very happy,” she said. 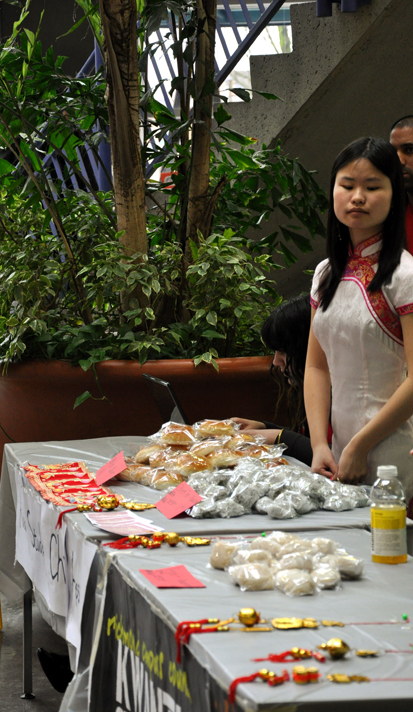 Nicole Joe, Richmond representative for the KSA, hands out tradition Chinese treats in the rotunda at the Richmond campus on Feb. 3. Photo by Miranda Gathercole.